Warning: Most of these photos were taken with point and shoot cameras. When on mountain, it's more about the skiing and boarding than about the photos. (written by Jen; approved by Ian) I'm from New Jersey; I learned to ski in my jeans in the Poconos. I thought skiing in jeans was cool. Ian grew up in Maryland (mostly), and despite being somewhat athletic, was told that skiing wasn't for him. To be precise, the ski instructor told him to not leave the magic carpet, i.e., he was not allowed on the ski lift. We've come a long way. Ian learned to snowboard, and I stopped skiing in my jeans. We went west the first year that Ian learned to board, and ever since, for us to take out all of that equipment, the mountain must be steep and big. Our favorite mountains in North America, in no particular order, are Snowbird outside of Salt Lake City, Utah; Jackson Hole in Jackson, Wyoming; and the Powder Highway in Canada (the portion that runs from Banff in Alberta to Revelstoke in British Columbia, which will be the subject of Where We Love to Ski and Board Part II). There are other great mountains we've skied, but to make this list, we had to have skied there so many times that it's getting hard to remember how many times. Snowbird, Utah. The highs of Snowbird: lots of steep and challenging terrain, 30 minutes from Salt Lake City International Airport, inexpensive ski-in-ski-out lodging options, to die for Mexican food, amazing views off the backside, a ride through the tunnel on your skis, and a solid spa. The lows of Snowbird (not even the greatest are perfect): no ski town, not many quality dining options, often subject to freeze thaw conditions, and some bare-bones lodging. But, if you need a ski town, Park City isn't that far away. If you need more food options, get a room with a kitchen and pick up some food from the market (that's what we do; plus, it's a good way to save some money). If there are freeze thaw conditions, sleep in and take advantage of the soft snow after the mountain warms up. And, if you need luxury, the Cliff Lodge has gone through a recent remodel with high-end finishes. Despite having been to Snowbird many times, the only photos we seem to have are from 2007 and 2009 . . . . Oldies, but goodies and before we were smart enough to wear helmets. Don't be dumb; wear a helmet. Jen and Steve showing the vastness of the basin. Steve proving that he had a good burrito. Ian proves that his burrito was also very good. Ian, Jen, Steve and Ashleigh celebrate Jen's Birthday on mountain. Our favorite time to go to Snowbird is during the Sundance Film Festival because most people in the area during this time are there for the Festival, not for the mountains. No lift lines! 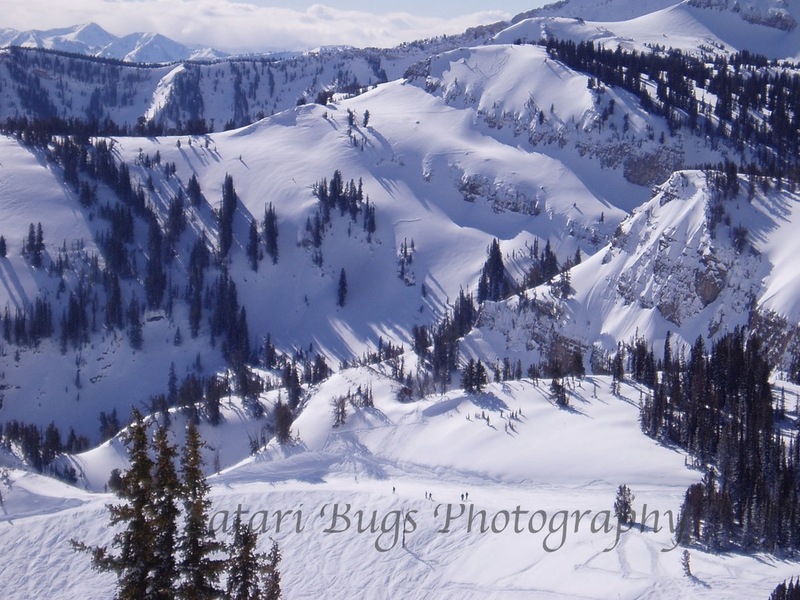 There are so many places to explore on the mountain that it's hard to choose favorites, but here's a few: skip the tram and take the tunnel to Mineral Basin in the morning for good light and fantastic bowl skiing (and if you need a groomer, there are some of those as well); take the Gad 2 chair for some extreme, steep tree skiing and then take a break on one of its wide-open blue groomers. Make your way over to Little Cloud for some big, open turns. And, if there is good snow in the afternoon, hit the Peruvian Gulch area. Jackson Hole, Wyoming. I want to live here. The highs of Jackson Hole: big, steep mountain with tons of varied terrain, lots of options for lodging on and off of the mountain covering all levels of luxury and wallet size (check out the Four Seasons for luxury ski-on-ski-off digs, the insanely cool Amangani (my favorite hotel in the U.S.) for, well just look it up; it speaks for itself, The Rusty Parrot Lodge for amazing service and an equally amazing massage, The White Buffalo Cub for affordable, comfortable condo style lodging, and the Rustic Inn for cheap and cozy lodging), draws top notch skiers and boarders elevating your game, the quintessential ski town, and some really good food (check out Nani's for homemade Italian sausage and house made pasta, The Blue Lion for mouth watering lamp chops and a romantic atmosphere, the Handlebar, though others say Mangy Moose, for post skiing beers and fried pickles, the Silver Dollar Bar for hot wings that will change your world, and Bin22 for a glass of wine and hand pulled mozzarella). The lows of Jackson Hole (even the greatest aren't perfect): Other than hiking, the only way to get to the very tippy top of the mountain is the Tram. The Tram line is often long, and when it snows a lot, it's near impossible to get on the Tram unless you want to stand in line for an hour. So, if it pukes snow, thank the snow gods, pool your funds, and hire a mountain guide/instructor. You'll skip the tram and lift lines, find some new lines down the mountain, learn some new technique, and earn those hot wings. Our favorite time to go to Jackson Hole is whenever the mountain is open. But if it is a good snow year, it is an unique experience to go closing weekend, which is April 2-3 this year. This weekend doesn't draw a lot of tourists and has a fun, party-like atmosphere (and there are good deals to be had on hotels and food). There are very few runs on this mountain we haven't done, and there are none that I dislike. If you like ungroomed bowls, get on the tram to Rendezvous Bowl into the Hobacks for an out of bounds like experience all inbounds. But first, get yourself a waffle at 10,450 feet at Corbet's Cabin. If you want to say you saw (but don't want to go down) Corbet's Couloir, then take the scenic Tensleep Bowl into Cirque. If groomed blues (that are rather steep) are your thing, hang out on the Casper and Teton quad chairs. Take time to stop at our favorite on mountain lunch spot, Nick Wilson's, for the buffalo chicken sandwich. **FYI - My brother, Steve, provided editorial support, i.e., finding my numerous typos. And, of course, Ian provided invaluable content for this blog and is my favorite travel companion in life!